Star Wars movies are not all run and gun. While many viewers just enjoy them as a spectacle, George Lucas puts plenty of subtley into his movies. You just have to pay attention. He crammed ROTS with some great little moments. 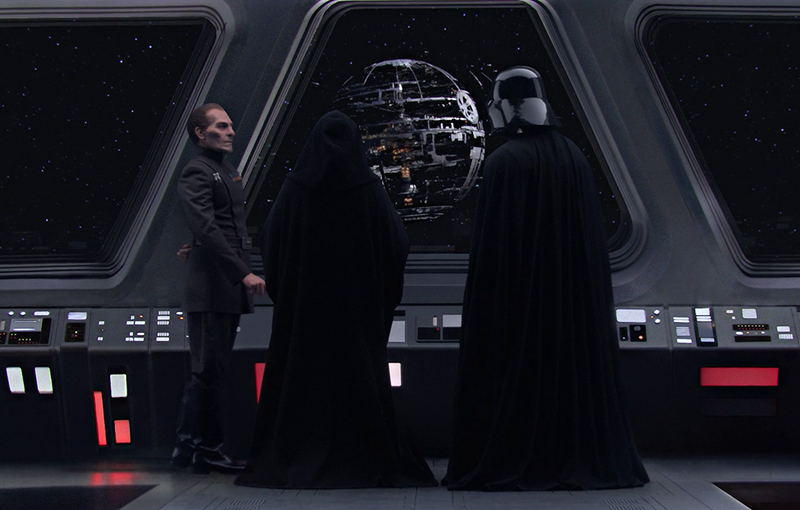 A quick character cameo occurs when Vader and the Emperor are standing on the bridge of a Star Destroyer, overlooking the initial construction stage of the Death Star. In a blink an you'll miss it moment, a young Moff Tarkin quietly sidles up to the Sith Lords. Moff Tarkin features heavily in A New Hope, it is he who orders the destruction of the planet Alderann. In Rogue One Tarkin is actually given an extended role. Guy Henry was motion captured acting out the role and a CGI version of Tarkin was placed over Henry's head. The character was quite great, showing a strong sense of ruthlessness in his ability to assume command over the Death Star from Krennic and to destroy his on troops on the ground when he fired the Death Star on his own Scarif base. Darth Vader's head was symmetrical for the first time in a Star Wars film. It was developed using precise machinery - the original was hand sculpted and was mildly aspherical! As General Kenobi is about to leave to hunt down General Grevious, he shares a nice moment with Anakin which finishes with a very loving, 'Good bye old friend' from Kenobi. This is the last time in the movie the two Jedi converse as friends. A key thing is the lighting - Anakin in the dark and Obi Wan in the light - it is a literal case of foreshadowing what was to come. Bail Organa and Yoda step into the hallway of Organa's ship and have a nice coversation about being rebels or something? It's the actual ship that Darth Vader boards to capture Princess Leia Organa in the start of A New Hope. But what was the most subtle part? Killing of the Younglings was a pretty obvious move. While the murder is off screen, it is blatant what Anakin has just done. He has murdered innocent children. Nothing subtle about that. The subtlety is that this moment was set up and a call back to the prior film, Attack of the Clones. Recall the scene where in front of the Younglings, Obi Wan and Yoda chat about how Obi want has lost a planet (how embarrassing!). This is the same class (but different students). Clever and chilling. Revenge of the Sith also featured a very cool reference to one of the films by a Japanese director that inspired the original Star Wars film. * Edited to remove the word 'immaculate' as some people take this stuff a little too seriously. The intention was to convey a comparison to the virgin birth of Mary's child. FYI, the Immaculate Conception" is the event in which Mary, the mother of Jesus was conceived (by a human father) without Original Sin. The Immaculate Conception is NOT the term used for Jesus's conception. Depends on your denomination. The notion of Mary being without original sin and remaining a virgin her entire life is a specifically Catholic belief. Most Protestant sects would use the term interchangeably with the "virgin birth". Thanks Scott! We are both talking about imaginary things, so everyone else understands the point. It sure does. And don't pretend any other way I don't have that right. Andrew: Please provide three pieces of evidence that any court would accept about this immaculate conception...which, as was pointed out earlier, was Mary's not Jesus'. Now prove that mine wasn't. Since you weren't there, how do you know? Seriously, Scott gets bent out of shape over James using the term 'immaculate conception'?!?!? Sheesh, calm down, the post is about a freaking movie! I don't think he meant it that way. The immaculate conception and Jesus' conception are two different events. Anakin having an "immaculate conception" would make him without sin. If you translate that into the Star Wars universe, I guess it would mean that Anakin would never become Darth Vader, which is obviously not what the author meant. I'm not sure how providing a correction to a phrase often used for the wrong thing is being "bent out of shape". I can semi believe in a Galactic Empire, Jedi, Sith, Midichlorians, Wookies and lightsabers. But this original sin, Mary and Jesus stuff is seriously far fetched and needs to be ret-conned for the sake of believability. The sheer number of mistakes in spelling in this article is embarrassing, I mean even MSword would tell you of a lot of these errors if you had bothered to look at what you had typed. Other times you are using incorrect "sound alike" words for things like when Obi Wan "Wants lost a planet" rather than "once lost" proof read your stuff before you submit it, if you post it like this it's clear that you don't think your work is worth reading yourself as such why should anyone else bother to read it? These are 10 things & 1 is from Rouge One, & most arent subtle at all! Jeez! What is this! Well, I, for one, find your conversation quite... interesting. If I didn't know any better, I'd call you all vociferous whippersnappers. Anyway, I believe that I have noticed a "something subtle" in Revenge of the Sith. Recall when Anakin enters the chancellor's office, shortly before Palpatine reveals himself to be Sidious. Palpatine's studying a red screen. I didn't think anything of it at first, but after watching that part a bajillion times, I started to wonder: What exactly was that? After collecting some further evidence, I have come to the logical conclusion that he was studying the plans for the Death Star. If you don't believe me, I'm giving you solid evidence. Remember that the moment Anakin enters the room, he switches it off. Later, when Mace Windu enters, he quickly turns around. I don't believe he was just staring off into space, no matter how beautiful Couruscant is. Also, do you remember that at the end of Attack of the Clones, Dooku says, "The designs will be safe with my master," or something like that? That proves he at least brought them to Sidious. Also, I discovered there was a lego set with Palpatine AND that same red screen. Somewhere in there, Sidious must have transferred them to where they were hidden in Rogue One. So, in conclusion, it's a minor detail that people skip over, but I believe it's relevant to the storyline. I wonder when he began thinking up those designs...? Haha. We'll we all know Mary was definitely with sin, having it off with god and then making poor Joseph take her across the desert to have his baby.